Cobra S3 Pro Gap Wedge DG S300 Sensicore Excellent! AWESOME COBRA AMP CELL PRO FORGED 3 IRON Driving iron with 19° loft, so it plays like a 2 iron. Great off the tee or for hitting stingers. KBS tour C taper lite 110 stiff shaft. Midsize Lamkin 360 grip. D5 swing weight, 39 1/4" length. See pics for condition. Shipped with USPS Priority Mail. The shaft is the factory issue N.S. PRO 1030H steel, Stiff Flex. This club is standard length and lie. A note from bob - This club was part of a demo/fitting set up at a local club. The specs are etched on the toe in tiny letters and are on a sticker on the shaft. Also, if you need an item gift wrapped, just ask! 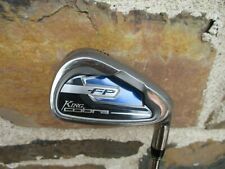 NEW Cobra Golf King F8 Individual Iron 4 Iron NS Pro 950GH Regular Flex. Condition is New. Shipped with USPS Priority Mail. Club: Cobra Baffler #7 Iron (2012). Shaft/Flex: Cobra Baffler steel, reg flex. Grip: Cobra Lamkin. Notes: think this to be from the 2012 model year. This gives you an accurate representation of what you are purchasing. Nice 4 iron in 9/10 condition. Had this in my bag of mizuno jpx 900 tours 5-pw, used this as a driving iron. Great off the tee or off the ground. FLT shaft really lifts the ball. If that’s what you are looking for in you long irons, this club is for you. King Cobra FP 6 Iron. King Cobra FP 8 Iron. MODEL: 3400I XH. SHAFT : NS Pro 900XH. Cobra Indvidual Iron. GRIP : Standard Cobra. Cobra King Tec Forged 4 Iron, steel shaft, regular flex, Right Handed Club is a 9.5 out of 10. See the pictures for proof. Never hit outdoors. Upgraded Mamiya Prototype IS 980S Stiff Shaft and New Devade MultiCompund Plus 4 Standard 52g White grip. This Cobra Bio-Cell Red 5 iron is in excellent condition. The original grip is in great condition. The Steel club head shows only light wear from normal use. Excellent Condition. ONE LENGTH 5 IRON only, other one length irons are shown as a reference. RH COBRA KING F7 #5 SINGLE IRON STEEL STIFF ONE LENGTH 37.25”. Condition is Used. Shipped with USPS Priority Mail. Cobra King F9 Variable Length (not one-length) 4 Iron. Right Handed. Steel Regular Flex Shaft. Standard length, loft (19.5), and lie. Only hit during one driving range session. The Villages Tri County Junior Golf, Inc. Very NICE Cobra CXI # 5 Iron. # 5 iron is in Very GOOD used condition(see photos). Regular flex. This is a King Cobra, Oversize, Driving Iron with a Firm Flex steel shaft. It's in nice overall condition showing light normal signs of age and use but no abuse. This is a listing for a Cobra Golf Mild Steel single 1 iron. This club is right handed and in good, used condition. It has a steel, stiff flex shaft and the grip will need replaced. This club measures 40" long and would be great for any golf fan. Cobra F-Max 8 Iron Steel Shaft Regular Flex Brand New Left Handed. Shipped with USPS Priority Mail. Cobra F-Max 5 Iron New Steel Left Handed. Shipped with USPS Priority Mail. DISCLOSURE: This club is brand new but there is a manufacturers painting defect on back of the club head. The face of the club is scratched. Shaft - KBS Tour C-Taper 120 Stiff Flex Steel. Dexterity - Left Handed. Grip - Cobra Lamkin UTX. Loft - 3 Iron. Very light scarring on the sole with the face still in excellent playing condition. King Cobra II Oversize Pitching wedge IQ Hump Graphite Stiff and original grip. . Condition is Used. Shipped with USPS Priority Mail. New ListingCobra S3 Pro Gap Wedge DG S300 Sensicore Excellent! Cobra S3 Pro iron Gap Wedge. Condition is Pre owned excellent condition! True temper Dynamic gold s300 sensicore. Shipped with USPS Priority Mail. Cobra King F6 7-iron is new. It features a Matrix Ozik Red Tie HQ4 70 shaft with a Cobra Lamkin 3 Gen grip. Model: King F6. Shaft Flex: Senior. Shaft Material: Graphite. Manufacturer: Cobra. Grip: Cobra Lamkin 3 Gen.
For sale is a single King Cobra Oversize 9 Iron. Used Cobra Baffler XL 6 Iron. turf interaction for consistent distance from anywhere. Stiff Cobra Steel Shaft. Cobra grip. • Deep Undercut Cavity provides a larger unsupported face area to. • Oversized Face Design and low cg design promotes high trajectory. Used. Right handed. 35.25 inches. True Temper Dynalite 90 Regular flex steel shaft. Winn Master Wrap grip. Zoom in on pictures to see condition for yourself. Shipped with USPS Priority Mail. Thanks for looking and check out my other auctions. YOU ARE CONSIDERING A KING COBRA FP 6 IRON WITH REGULAR FLEX LIGHTWEIGHT STEEL SHAFT. CLUB AND COBRA GRIP IS IN GOOD CONDITION. PLEASE SEE PHOTOS. New ListingUsed King Cobra Oversize Right Handed Single 5 Iron Golf Club Reg. Steel Shaft! Club is in Very Good condition. King Cobra Grip. New ListingUsed King Cobra Oversize Right Handed Single 6 Iron Golf Club Reg. Steel Shaft!